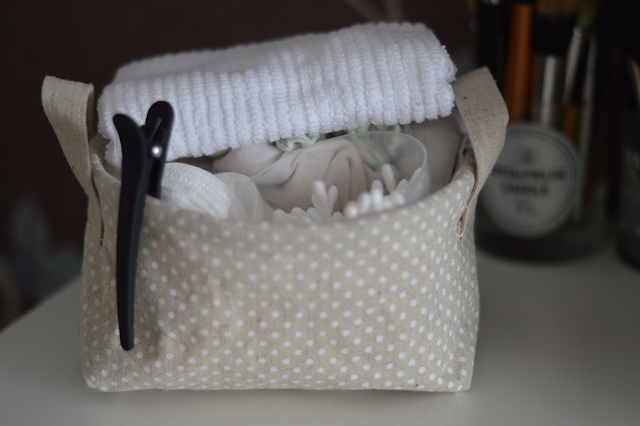 I store my muslin cloths, cotton pads and cotton buds in a little cloth basket behind my skincare tray. I bought a set of 3 for under £5. I use to store them in these cloth baskets from H&M which are pretty and cheap. As for my makeup brushes, I've recycled my empty glass candle votive's and have put them to good use. I have 2 large ones which house all my face and eye brushes snuggly. 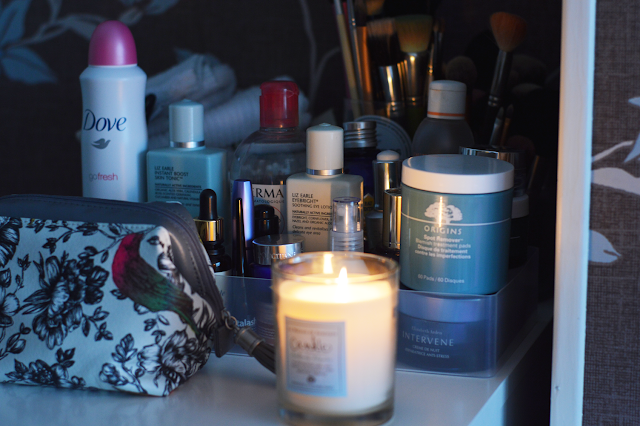 I have my makeup bag at hand which has my most recent makeup items which I'm currently using and enjoying. 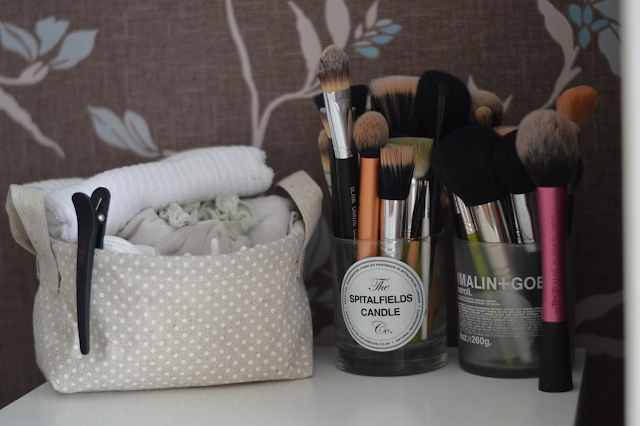 By having my makeup bag on hand it helps make my beauty routine all that more quicker and easier. 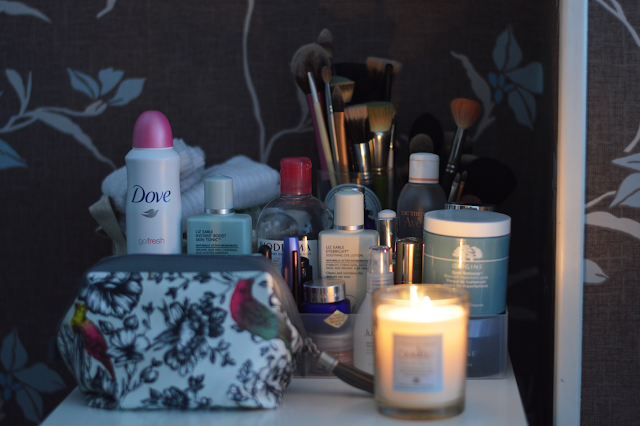 Having my beauty products organised like this makes such a difference, I know exactly where everything is and can put my finger on it quickly without any fuss, a great tip in the morning. I hope this quick blog post has been of some use to you! 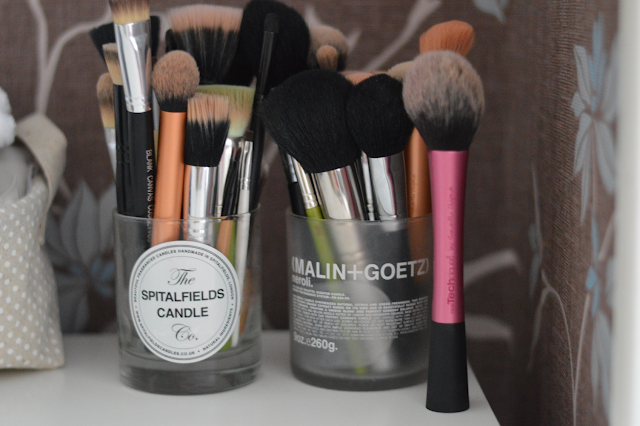 Ooh i like the idea of using old candle's jars to house your brushes! I like this with The candles jars...nice thought girl,you put me ideas! !! you're so clever. After reading this I have a legitimate excuse for saving my empty glass jars! Before, "pretty" was the only requirement to save them from the recycle bin. I think they look so cute also! Plus I like a bit of recycling/upcycling!